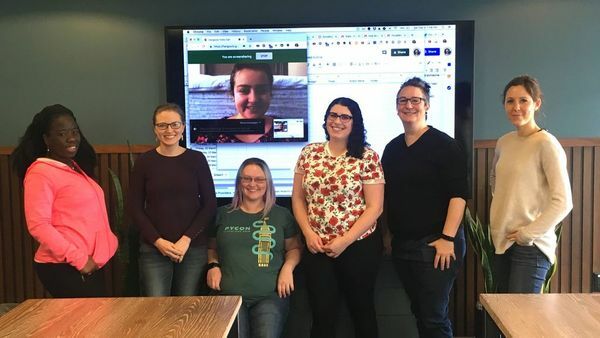 We are an international mentorship group with a focus on helping more women and people who identify as women in a way significant to them become active participants and leaders in the Python open-source community. Our mission is to promote, educate and advance a diverse Python community through outreach, education, conferences, events and social gatherings. PyLadies also aims to provide a friendly support network for women and a bridge to the larger Python world. Anyone with an interest in Python is encouraged to participate! If you'd like to participate in one of our events but have reasons not to have an online presence, please feel free to contact us. Here is the global PyLadies Code of Conduct. PyLadiesSF applies the more specific LadyNerds Code of Conduct because we are dedicated to providing a safe, inclusive, welcoming, and harassment-free space and experience for all members and guests, regardless of gender identity and expression, sexual orientation, disability, physical appearance, socioeconomic status, body size, ethnicity, nationality, level of experience, age, or religion (or lack thereof). The Code of Conduct exists because of that dedication. We do not tolerate harassment in any form and we prioritize marginalized people’s safety over privileged people’s comfort. To contact us, please email sf@pyladies.com. This email address also accepts PayPal donations, or you can contribute at https://secure.meetup.com/PyLadiesSF/contribute/. We are officially part of the Python Software Foundation. This is a weekly Study Group where attendees have time to work on deep learning projects in a helpful and supportive environment. Many people who attend are using the fastai library on top of PyTorch to build models. ** 7:00 - 9:00 (2h) Get work done! Join our Slack Workspace (http://bit.ly/JoinSlackFastaiSFbay) and channel #sg-sf (stands for "study group - sf") for questions about logistics (flag @Deena & @Molly) or to share links. We prefer you post code on the forum (https://forums.fast.ai/). If you avoid social media and therefore cannot signup via meetup, you are still welcome to these events, just show up and check in with the organizers.